In App Studio, you can now replace some custom implementations with model-driven solutions for your case design. By using standard configurations in a case life cycle, you can add capabilities to a case type more quickly. This configuration resolves child cases when a parent case reaches the end of its life cycle. 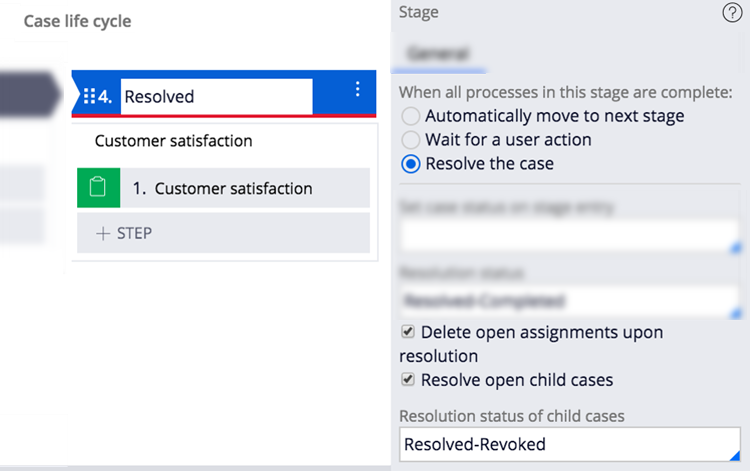 You can optionally assign a final status to child cases that is different from the final status of the parent case. The following figure illustrates the available options when you click a resolution stage in a parent case type. For more information, see Configuring case resolution. This configuration changes the status of a case when the case moves from one stage to another in the case life cycle. You can choose an existing status or create a custom status. The following figure illustrates a stage that sets the case status to Pending-Details. For more information, see Changing the status of a case. This configuration skips a stage in the case life cycle, based on the conditions that you define. You can compare the values of fields in a case to create simple or complex conditions. The following figure illustrates the options for conditional stage entry. For more information, see Requiring conditions for stage entry.